As Thailand is now heading towards an elderly society, the Industry Ministry’s Office of Industrial Economics has projected that the country would need about 3.3 million workers for five key industries from 2015 – 2017. Udom Wongwiwatchai, director-general of the Office of Industrial Economics, said a possible of shortage of workers in five principle industries, including food and beverage, garment and textile, electronics, auto and parts, and industrial and machinery, was based on data collected in 2011 and 2012, and assuming that Thailand’s economy would grow 4 percent from 2015 – 2017. 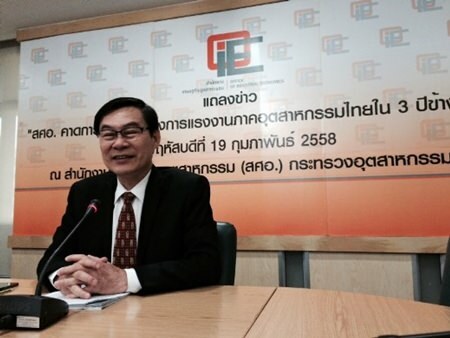 Udom Wongwiwatchai, director-general of the Office of Industrial Economics. He found that demand for workers in those five key industries would be as high as 3.3 million, adding that Thailand would have to depend on employing foreign workers in these industries because the country is becoming an aged society. Unemployment in the country stood at only 0.6 – 0.7 percent. Workers’ skills must be further improved while operators must be prepared for investment in machinery, research and development, and lay out production and human development strategies over the short- and long-term, Udom said.